Elderly patients with dementia-related psychosis treated with antipsychotic drugs are at an increased risk of death. Analysis of seventeen placebo-controlled trials (modal duration 10 weeks), largely in patients taking atypical antipsychotic drugs, revealed a risk of death in the drug-treated patients of between 1.6 to 1.7 times the risk of death in placebo-treated patients. Over the course of a typical 10-week controlled trial, the rate of death in drug-treated patients was about 4.5%, compared to a rate of about 2.6% in the placebo group. Although the causes of death were varied, most of the deaths appeared to be either cardiovascular (e.g., heart failure, sudden death) or infectious (e.g., pneumonia) in nature. Observational studies suggest that, similar to atypical antipsychotic drugs, treatment with conventional antipsychotic drugs may increase mortality. The extent to which the findings of increased mortality in observational studies may be attributed to the antipsychotic drug as opposed to some characteristic(s) of the patients is not clear. FANAPT is not approved for the treatment of patients with Dementia-Related Psychosis [see Warnings and Precautions (5.1)]. These highlights do not include all the information needed to use FANAPT safely and effectively. See full prescribing information for FANAPT. 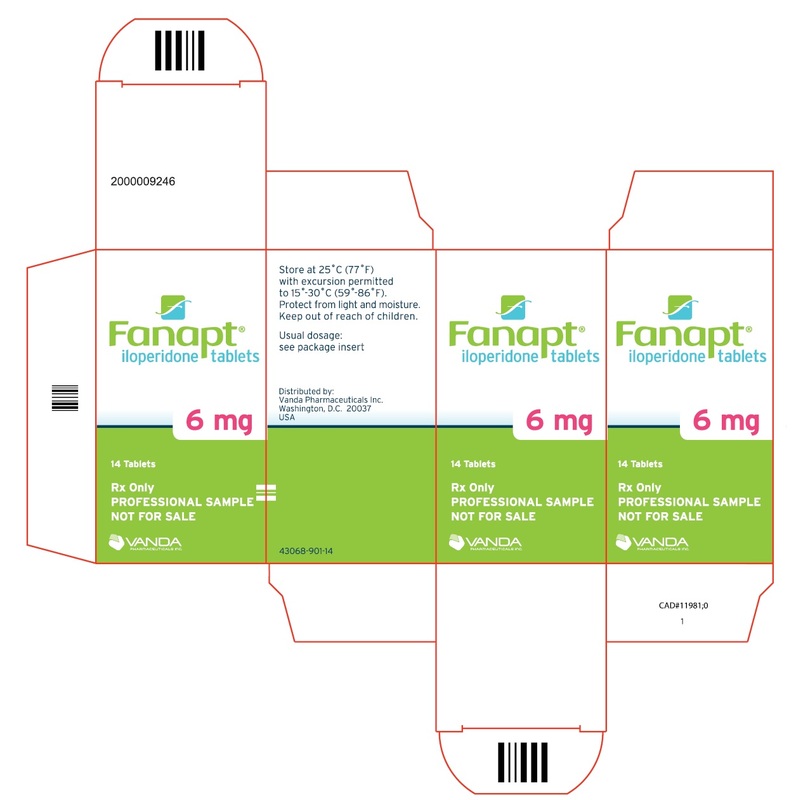 FANAPT is an atypical antipsychotic agent indicated for the treatment of schizophrenia in adults. (1) Efficacy was established in two short-term (4- and 6-week) placebo- and active-controlled studies of adult patients with schizophrenia. (14) In choosing among treatments, prescribers should consider the ability of FANAPT to prolong the QT interval and the use of other drugs first. Prescribers should also consider the need to titrate FANAPT slowly to avoid orthostatic hypotension, which may lead to delayed effectiveness compared to some other drugs that do not require similar titration. To report SUSPECTED ADVERSE REACTIONS, contact Vanda Pharmaceuticals Inc. at 1-844-GO-VANDA (1-844-468-2632) or FDA at 1-800-FDA-1088 or www.fda.gov/medwatch. 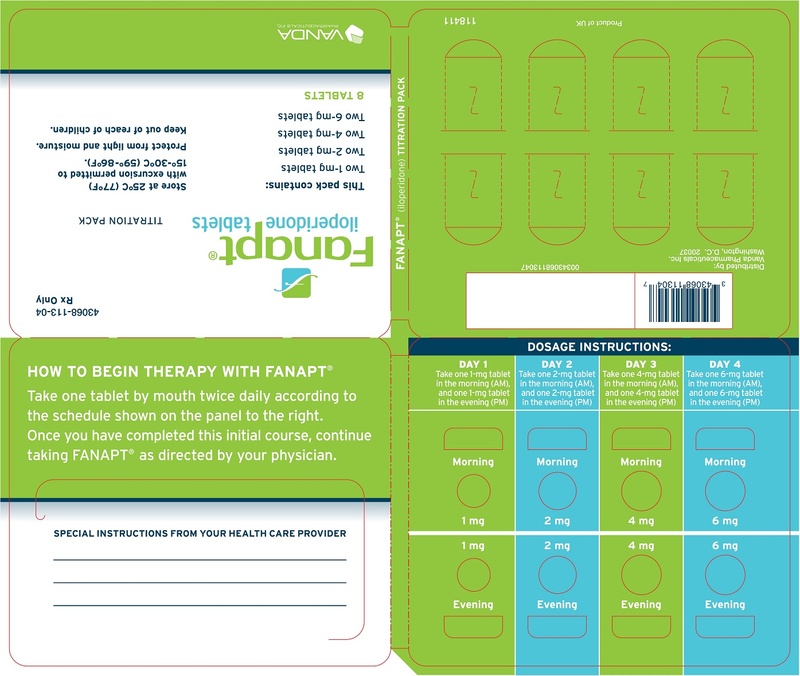 FANAPT® tablets are indicated for the treatment of adults with schizophrenia. Efficacy was established in two short-term (4- and 6-week) placebo-and active-controlled studies of adult patients with schizophrenia [see Clinical Studies (14)]. When deciding among the alternative treatments available for this condition, the prescriber should consider the finding that FANAPT is associated with prolongation of the QTc interval [see Warnings and Precautions (5.2)]. Prolongation of the QTc interval is associated in some other drugs with the ability to cause torsade de pointes-type arrhythmia, a potentially fatal polymorphic ventricular tachycardia which can result in sudden death. In many cases this would lead to the conclusion that other drugs should be tried first. Whether FANAPT will cause torsade de pointes or increase the rate of sudden death is not yet known. Patients must be titrated to an effective dose of FANAPT. Thus, control of symptoms may be delayed during the first 1 to 2 weeks of treatment compared to some other antipsychotic drugs that do not require a similar titration. Prescribers should be mindful of this delay when selecting an antipsychotic drug for the treatment of schizophrenia [see Dosage and Administration (2.1) and Clinical Studies (14)]. FANAPT must be titrated slowly from a low starting dose to avoid orthostatic hypotension due to its alpha-adrenergic blocking properties. The recommended starting dose for FANAPT tablets is 1 mg twice daily. Dose increases to reach the target range of 6-12 mg twice daily (12_24 mg/day) may be made with daily dosage adjustments not to exceed 2 mg twice daily (4 mg/day). The maximum recommended dose is 12 mg twice daily (24 mg/day). FANAPT doses above 24 mg/day have not been systematically evaluated in the clinical trials. Efficacy was demonstrated with FANAPT in a dose range of 6 to 12 mg twice daily. Prescribers should be mindful of the fact that patients need to be titrated to an effective dose of FANAPT. Thus, control of symptoms may be delayed during the first 1 to 2 weeks of treatment compared to some other antipsychotic drugs that do not require similar titration. Prescribers should also be aware that some adverse effects associated with FANAPT use are dose related. FANAPT can be administered without regard to meals. Dosage adjustments are not routinely indicated on the basis of age, gender, race, or renal impairment status [see Use in Specific Populations (8.6, 8.7)]. Dosage adjustment for patients taking FANAPT concomitantly with potential CYP2D6 inhibitors: FANAPT dose should be reduced by one-half when administered concomitantly with strong CYP2D6 inhibitors such as fluoxetine or paroxetine. When the CYP2D6 inhibitor is withdrawn from the combination therapy, FANAPT dose should then be increased to where it was before [see Drug Interactions (7.1)]. Dosage adjustment for patients taking FANAPT concomitantly with potential CYP3A4 inhibitors: FANAPT dose should be reduced by one-half when administered concomitantly with strong CYP3A4 inhibitors such as ketoconazole or clarithromycin. When the CYP3A4 inhibitor is withdrawn from the combination therapy, FANAPT dose should be increased to where it was before [see Drug Interactions (7.1)]. Dosage adjustment for patients taking FANAPT who are poor metabolizers of CYP2D6: FANAPT dose should be reduced by one-half for poor metabolizers of CYP2D6 [see Clinical Pharmacology, Pharmacokinetics (12.3)]. Hepatic Impairment: No dose adjustment to FANAPT is needed in patients with mild hepatic impairment. Exercise caution when administering it to patients with moderate hepatic impairment. FANAPT is not recommended for patients with severe hepatic impairment [see Use in Specific Populations (8.7)]. FANAPT tablets are available in the following strengths: 1 mg, 2 mg, 4 mg, 6 mg, 8 mg, 10 mg, and 12 mg. The tablets are white, round, flat, beveled-edged and identified with a logo â€œ â€ debossed on one side and tablet strength â€œ1â€, â€œ2â€, â€œ4â€, â€œ6â€, â€œ8â€, â€œ10â€, or â€œ12â€ debossed on the other side. FANAPT is contraindicated in individuals with a known hypersensitivity reaction to the product. Anaphylaxis, angioedema, and other hypersensitivity reactions have been reported [see Adverse Reactions (6.2)]. Elderly patients with dementia-related psychosis treated with atypical antipsychotic drugs are at an increased risk of death compared to placebo. FANAPT is not approved for the treatment of patients with dementia-related psychosis [see Boxed Warning]. 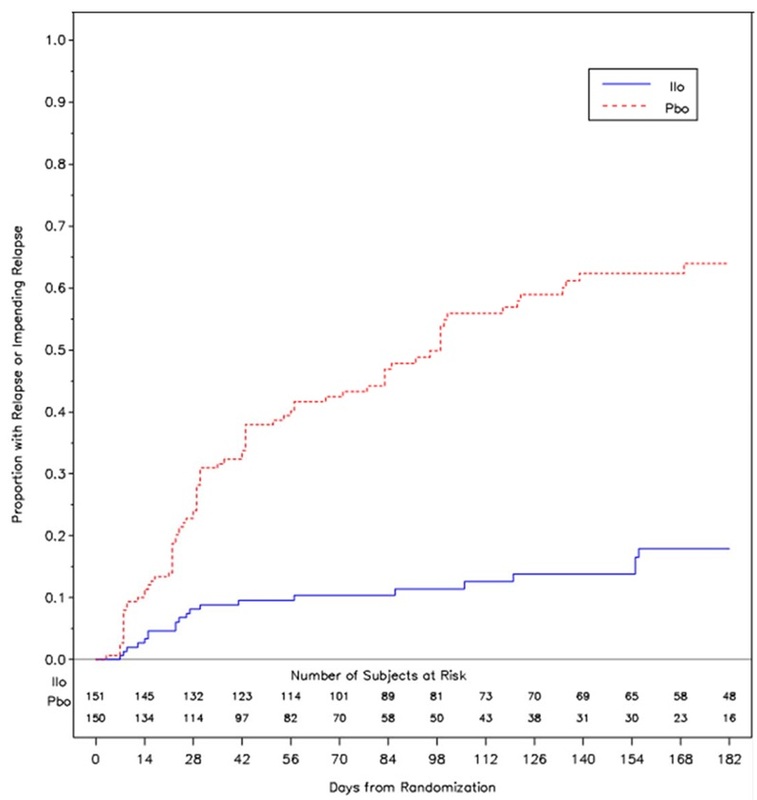 In placebo-controlled trials with risperidone, aripiprazole, and olanzapine in elderly patients with dementia, there was a higher incidence of cerebrovascular adverse events (cerebrovascular accidents and transient ischemic attacks) including fatalities compared to placebo-treated patients. FANAPT is not approved for the treatment of patients with dementia-related psychosis [see Boxed Warning]. Caution is warranted when prescribing FANAPT with drugs that inhibit FANAPT metabolism [see Drug Interactions (7.1)], and in patients with reduced activity of CYP2D6 [see Clinical Pharmacology (12.3)]. It is recommended that patients being considered for FANAPT treatment who are at risk for significant electrolyte disturbances have baseline serum potassium and magnesium measurements with periodic monitoring. Hypokalemia (and/or hypomagnesemia) may increase the risk of QT prolongation and arrhythmia. FANAPT should be avoided in patients with histories of significant cardiovascular illness, e.g., QT prolongation, recent acute myocardial infarction, uncompensated heart failure, or cardiacarrhythmia. FANAPT should be discontinued in patients who are found to have persistent QTc measurements >500 msec. A potentially fatal symptom complex sometimes referred to as Neuroleptic Malignant Syndrome (NMS) has been reported in association with administration of antipsychotic drugs, including FANAPT. Clinical manifestations include hyperpyrexia, muscle rigidity, altered mental status (including catatonic signs) and evidence of autonomic instability (irregular pulse or blood pressure, tachycardia, diaphoresis, and cardiac dysrhythmia). Additional signs may include elevated creatine phosphokinase, myoglobinuria (rhabdomyolysis), and acute renal failure. The diagnostic evaluation of patients with this syndrome is complicated. In arriving at a diagnosis, it is important to identify cases in which the clinical presentation includes both serious medical illness (e.g., pneumonia, systemic infection, etc.) and untreated or inadequately treated extrapyramidal signs and symptoms (EPS). Other important considerations in the differential diagnosis include central anticholinergic toxicity, heat stroke, drug fever, and primary central nervous system (CNS) pathology. Tardive dyskinesia is a syndrome consisting of potentially irreversible, involuntary, dyskinetic movements, which may develop in patients treated with antipsychotic drugs. Although the prevalence of the syndrome appears to be highest among the elderly, especially elderly women, it is impossible to rely on prevalence estimates to predict, at the inception of antipsychotic treatment, which patients are likely to develop the syndrome. Whether antipsychotic drug products differ in their potential to cause tardive dyskinesia is unknown. Atypical antipsychotic drugs have been associated with metabolic changes that may increase cardiovascular/cerebrovascular risk. These metabolic changes include hyperglycemia, dyslipidemia, and body weight gain [see Patient Counseling Information (17.3)]. While all atypical antipsychotic drugs have been shown to produce some metabolic changes, each drug in the class has its own specific risk profile. Hyperglycemia, in some cases extreme and associated with ketoacidosis or hyperosmolar coma or death, has been reported in patients treated with atypical antipsychotics including FANAPT. Assessment of the relationship between atypical antipsychotic use and glucose abnormalities is complicated by the possibility of an increased background risk of diabetes mellitus in patients with schizophrenia and the increasing incidence of diabetes mellitus in the general population. Given these confounders, the relationship between atypical antipsychotic use and hyperglycemia-related adverse events is not completely understood. However, epidemiological studies suggest an increased risk of treatment-emergent hyperglycemia-related adverse events in patients treated with the atypical antipsychotics included in these studies. Because FANAPT was not marketed at the time these studies were performed, it is not known if FANAPT is associated with this increased risk. Data from a 4-week, fixed-dose study in adult subjects with schizophrenia, in which fasting blood samples were drawn,are presented in Table 1. Pooled analyses of glucose data from clinical studies including longer term trials are shown in Table 2. Data from a placebo-controlled, 4-week, fixed-dose study, in which fasting blood samples were drawn, in adult subjects with schizophrenia are presented in Table 3. Pooled analyses of cholesterol and triglyceride data from clinical studies including longer term trials are shown in Tables 4 and 5. Changes in body weight (kg) and the proportion of subjects with â‰¥7% gain in body weight from 4 placebo-controlled, 4- or 6-week, fixed- or flexible-dose studies in adult subjects are presented in Table 6. In short-term placebo-controlled trials (4- to 6-weeks), seizures occurred in 0.1% (1/1344) of patients treated with FANAPT compared to 0.3% (2/587) on placebo. As with other antipsychotics, FANAPT should be used cautiously in patients with a history of seizures or with conditions that potentially lower the seizure threshold, e.g., Alzheimerâ€™s dementia. Conditions that lower the seizure threshold may be more prevalent in a population of 65 years or older. Hyperprolactinemia may suppress hypothalamicGnRH, resulting in reduced pituitary gonadotropin secretion. This, in turn, may inhibit reproductive function by impairing gonadalsteroidogenesis in both female and male patients. Galactorrhea, amenorrhea, gynecomastia, and impotence have been reported with prolactin-elevating compounds. Long-standing hyperprolactinemia when associated with hypogonadism may lead to decreased bone density in both female and male patients. Tissue culture experiments indicate that approximately one-third of human breast cancers are prolactin-dependent in vitro, a factor of potential importance if the prescription of these drugs is contemplated in a patient with previously detected breast cancer. Mammary gland proliferative changes and increases in serum prolactin were seen in mice and rats treated with FANAPT [see Nonclinical Toxicology (13.1)]. Neither clinical studies nor epidemiologic studies conducted to date have shown an association between chronic administration of this class of drugs and tumorigenesis in humans; the available evidence is considered too limited to be conclusive at this time. Disruption of the bodyâ€™s ability to reduce core body temperature has been attributed to antipsychotic agents. 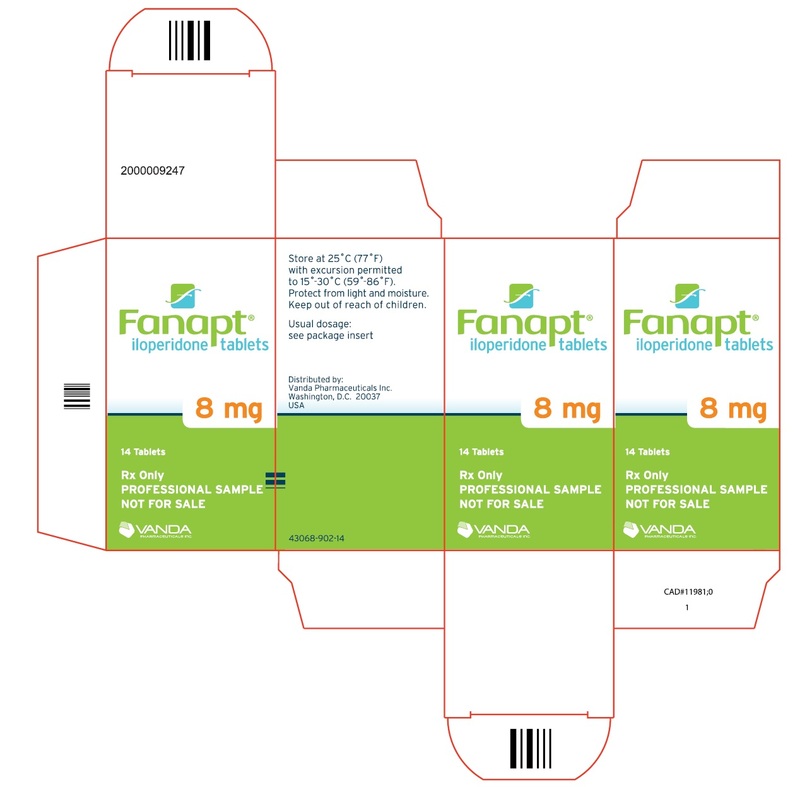 Appropriate care is advised when prescribing FANAPT for patients who will be experiencing conditions which may contribute to an elevation in core body temperature, e.g., exercising strenuously, exposure to extreme heat, receiving concomitant medication with anticholinergic activity, or being subject to dehydration. Esophageal dysmotility and aspiration have been associated with antipsychotic drug use. Aspiration pneumonia is a common cause of morbidity and mortality in elderly patients, in particular those with advanced Alzheimerâ€™s dementia. FANAPT and other antipsychotic drugs should be used cautiously in patients at risk for aspiration pneumonia [see Boxed Warning]. Because clinical trials are conducted under widely varying conditions, adverse reaction rates observed in the clinical trial of a drug cannot be directly compared to rates in the clinical trials of another drug and may not reflect the rates observed in clinical practice. The information below is derived from a clinical trial database for FANAPT consisting of 2070 patients exposed to FANAPT at doses of 10 mg/day or greater, for the treatment of schizophrenia. Of these, 806 received FANAPT for at least 6 months, with 463 exposed to FANAPT for at least 12 months. All of these patients who received FANAPT were participating in multiple-dose clinical trials. The conditions and duration of treatment with FANAPT varied greatly and included (in overlapping categories), open-label and double-blind phases of studies, inpatients and outpatients, fixed-dose and flexible-dose studies, and short-term and longer-term exposure. Adverse reactions during exposure were obtained by general inquiry and recorded by clinical investigators using their own terminology. Consequently, to provide a meaningful estimate of the proportion of individuals experiencing adverse reactions, reactions were grouped in standardized categories using MedDRA terminology. The stated frequencies of adverse reactions represent the proportions of individuals who experienced a treatment-emergent adverse reaction of the type listed. A reaction was considered treatment emergent if it occurred for the first time or worsened while receiving therapy following baseline evaluation. The information presented in these sections was derived from pooled data from 4 placebo-controlled, 4- or 6-week, fixed- or flexible-dose studies in patients who received FANAPT at daily doses within a range of 10 to 24 mg (n=874). Table 7 enumerates the pooled incidences of treatment-emergent adverse reactions that were spontaneously reported in four placebo-controlled, 4- or 6-week, fixed- or flexible-dose studies, listing those reactions that occurred in 2% or more of patients treated with FANAPT in any of the dose groups, and for which the incidence in FANAPT-treated patients in any dose group was greater than the incidence in patients treated with placebo. * Table includes adverse reactions that were reported in 2% or more of patients in any of the FANAPT dose groups and which occurred at greater incidence than in the placebo group. Figures rounded to the nearest integer. Based on the pooled data from 4 placebo-controlled, 4- or 6-week, fixed- or flexible-dose studies, adverse reactions that occurred with a greater than 2% incidence in the patients treated with FANAPT, and for which the incidence in patients treated with FANAPT 20-24 mg/day were twice than the incidence in patients treated with FANAPT 10-16 mg/day were: abdominal discomfort, dizziness, hypotension, musculoskeletal stiffness, tachycardia, and weight increased. Based on the pooled data from 4 placebo-controlled, 4- or 6-week, fixed- or flexible-dose studies, the following adverse reactions occurred in â‰¥5% incidence in the patients treated with FANAPT and at least twice the placebo rate for at least 1 dose: dizziness, dry mouth, fatigue, nasal congestion, somnolence, tachycardia, orthostatic hypotension, and weight increased. Dizziness, tachycardia, and weight increased were at least twice as common on 20-24 mg/day as on 10-16 mg/day. Pooled data from the 4 placebo-controlled, 4- or 6-week, fixed- or flexible-dose studies provided information regarding treatment-emergent EPS. Adverse event data collected from those trials showed the following rates of EPS-related adverse events as shown in Table 8. Based on the pooled data from 4 placebo-controlled, 4- or 6-week, fixed- or flexible-dose studies, there was no difference in the incidence of discontinuation due to adverse events between FANAPT-treated (5%) and placebo-treated (5%) patients. The types of adverse events that led to discontinuation were similar for the FANAPT- and placebo-treated patients. An examination of population subgroups in the 4 placebo-controlled, 4- or 6-week, fixed- or flexible-dose studies did not reveal any evidence of differences in safety on the basis of age, gender or race [see Warnings and Precautions (5.1)]. The following is a list of MedDRA terms that reflect treatment-emergent adverse reactions in patients treated with FANAPT at multiple doses â‰¥ 4 mg/day during any phase of a trial with the database of 3210 FANAPT-treated patients. All reported reactions are included except those already listed in Table 7, or other parts of the Adverse Reactions (6) section, those considered in the Warnings and Precautions (5), those reaction terms which were so general as to be uninformative, reactions reported in fewer than 3 patients and which were neither serious nor life-threatening, reactions that are otherwise common as background reactions, and reactions considered unlikely to be drug related. It is important to emphasize that, although the reactions reported occurred during treatment with FANAPT, they were not necessarily caused by it. Reproductive System and Breast Disorders: Frequent â€“ erectile dysfunction; Infrequent â€“ testicular pain, amenorrhea, breast pain; Rare â€“ menstruation irregular, gynecomastia, menorrhagia, metrorrhagia, postmenopausal hemorrhage, prostatitis. Iloperidone is not a substrate for CYP1A1, CYP1A2, CYP2A6, CYP2B6, CYP2C8, CYP2C9, CYP2C19, or CYP2E1 enzymes. This suggests that an interaction of iloperidone with inhibitors or inducers of these enzymes, or other factors, like smoking, is unlikely. Both CYP3A4 and CYP2D6 are responsible for iloperidone metabolism. Inhibitors of CYP3A4 (e.g., ketoconazole) or CYP2D6 (e.g., fluoxetine, paroxetine) can inhibit iloperidone elimination and cause increased blood levels. Dextromethorphan: A study in healthy volunteers showed that changes in the pharmacokinetics of dextromethorphan (80 mg dose) when a 3 mg dose of iloperidone was co-administered resulted in a 17% increase in total exposure and a 26% increase in the maximum plasma concentrations Cmax of dextromethorphan. Thus, an interaction between iloperidone and other CYP2D6 substrates is unlikely. Midazolam (a sensitive CYP 3A4 substrate): A study in patients with schizophrenia showed a less than 50% increase in midazolam total exposure at iloperidone steady state (14 days of oral dosing at up to 10 mg iloperidone twice daily) and no effect on midazolam Cmax. Thus, an interaction between iloperidone and other CYP3A4 substrates is unlikely. FANAPT should not be used with any other drugs that prolong the QT interval [see Warnings and Precautions (5.2)]. FANAPT caused developmental toxicity, but was not teratogenic, in rats and rabbits. In an embryo-fetal development study, pregnant rats were given 4, 16, or 64 mg/kg/day (1.6, 6.5, and 26 times the maximum recommended human dose (MRHD) of 24 mg/day on a mg/m2 basis) of iloperidone orally during the period of organogenesis. The highest dose caused increased early intrauterine deaths, decreased fetal weight and length, decreased fetal skeletal ossification, and an increased incidence of minor fetal skeletal anomalies and variations; this dose also caused decreased maternal food consumption and weight gain. In additional studies in which rats were given iloperidone at doses similar to the above beginning from either pre-conception or from day 17 of gestation and continuing through weaning, adverse reproductive effects included prolonged pregnancy and parturition, increased stillbirth rates, increased incidence of fetal visceral variations, decreased fetal and pup weights, and decreased post-partum pup survival. There were no drug effects on the neurobehavioral or reproductive development of the surviving pups. No-effect doses ranged from 4 to 12 mg/kg except for the increase in stillbirth rates which occurred at the lowest dose tested of 4 mg/kg, which is 1.6 times the MRHD on a mg/m2 basis. Maternal toxicity was seen at the higher doses in these studies. The iloperidone metabolite P95, which is a major circulating metabolite of iloperidone in humans but is not present in significant amounts in rats, was given to pregnant rats during the period of organogenesis at oral doses of 20, 80, or 200 mg/kg/day. No teratogenic effects were seen. Delayed skeletal ossification occurred at all doses. No significant maternal toxicity was produced. Plasma levels of P95 (AUC) at the highest dose tested were 2 times those in humans receiving the MRHD of iloperidone. FANAPT should be used during pregnancy only if the potential benefit justifies the potential risk to the fetus. Clinical Studies of FANAPT in the treatment of schizophrenia did not include sufficient numbers of patients aged 65 years and over to determine whether or not they respond differently than younger adult patients. Of the 3210 patients treated with FANAPT in premarketing trials, 25 (0.5%) were â‰¥65 years old and there were no patients â‰¥75 years old. Studies of elderly patients with psychosis associated with Alzheimerâ€™s disease have suggested that there may be a different tolerability profile (i.e., increased risk in mortality and cerebrovascular events including stroke) in this population compared to younger patients with schizophrenia [see Boxed Warning and Warnings and Precautions (5.1)]. The safety and efficacy of FANAPT in the treatment of patients with psychosis associated with Alzheimerâ€™s disease has not been established. If the prescriber elects to treat such patients with FANAPT, vigilance should be exercised. Because FANAPT is highly metabolized, with less than 1% of the drug excreted unchanged, renal impairment alone is unlikely to have a significant impact on the pharmacokinetics of FANAPT. Renal impairment (creatinine clearance <30 mL/min) had minimal effect on Cmax of iloperidone (given in a single dose of 3 mg) and its metabolites P88 and P95 in any of the 3analytes measured. AUC0â€“âˆž was increased by 24%, decreased by 6%, and increased by 52% for iloperidone, P88 and P95, respectively, in subjects with renal impairment. No dose adjustment to FANAPT is needed in patients with mild hepatic impairment. Exercise caution when administering it to patients with moderate hepatic impairment. FANAPT is not recommended for patients with severe hepatic impairment [see Dosage in Special Populations (2.2)]. FANAPT tablets are intended for oral administration only. Each round, uncoated tablet contains 1 mg, 2 mg, 4 mg, 6 mg, 8 mg, 10 mg, or 12 mg of iloperidone. Inactive ingredients are: lactose monohydrate, microcrystalline cellulose, hydroxypropylmethylcellulose, crospovidone, magnesium stearate, colloidal silicon dioxide, and purified water (removed during processing). The tablets are white, round, flat, beveled-edged and identified with a logo â€œ â€ debossed on one side and tablet strength â€œ1â€, â€œ2â€, â€œ4â€, â€œ6â€, â€œ8â€, â€œ10â€, or â€œ12â€ debossed on the other side. The mechanism of action of FANAPT, as with other drugs having efficacy in schizophrenia, is unknown. However it is proposed that the efficacy of FANAPT is mediated through a combination of dopamine type 2 (D2) and serotonin type 2 (5-HT2) antagonisms. FANAPT exhibits high (nM) affinity binding to serotonin 5-HT2Adopamine D2 and D3 receptors, and norepinephrine NEÎ±1 receptors (Ki values of 5.6, 6.3, 7.1, and 0.36 nM, respectively). 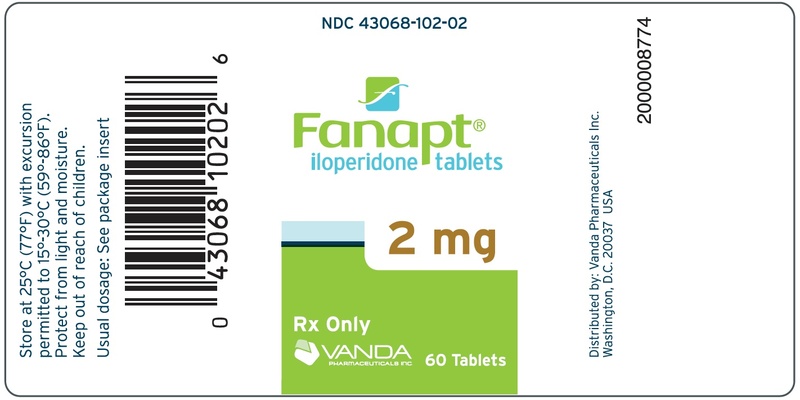 FANAPT has moderate affinity for dopamine D4, and serotonin 5-HT6 and 5-HT7receptors (Ki values of 25, 43, and 22, nM respectively), and low affinity for the serotonin 5-HT1A, dopamine D1, and histamine H1 receptors (Ki values of 168, 216 and 437 nM, respectively). FANAPT has no appreciable affinity (Ki >1000 nM) for cholinergic muscarinic receptors. FANAPT functions as an antagonist at the dopamine D2, D3, serotonin 5-HT1A and norepinephrine Î±1/Î±2C receptors. The affinity of the FANAPT metabolite P88 is generally equal or less than that of the parent compound. In contrast, the metabolite P95 only shows affinity for 5-HT2A (Ki value of 3.91) and the NEÎ±1A, NEÎ±1B, NEÎ±1D, and NEÎ±2C receptors (Ki values of 4.7, 2.7, 8.8 and 4.7 nM respectively). The observed mean elimination half-lives for iloperidone, P88 and P95 in CYP2D6 extensive metabolizers (EM) are 18, 26, and 23 hours, respectively, and in poor metabolizers (PM) are 33, 37 and 31 hours, respectively. Steady-state concentrations are attained within 3-4 days of dosing. Iloperidone accumulation is predictable from single-dose pharmacokinetics. The pharmacokinetics of iloperidone is more than dose proportional. Elimination of iloperidone is mainly through hepatic metabolism involving 2 P450 isozymes, CYP2D6 and CYP3A4. Approximately 7% - 10% of Caucasians and 3% - 8% of black/African Americans lack the capacity to metabolize CYP2D6 substrates and are classified as poor metabolizers (PM), whereas the rest are intermediate, extensive or ultrarapid metabolizers. Coadministration of FANAPT with known strong inhibitors of CYP2D6 like fluoxetine results in a 2.3-fold increase in iloperidone plasma exposure, and therefore one-half of the FANAPT dose should be administered. The carcinogenic potential of the iloperidone metabolite P95, which is a major circulating metabolite of iloperidone in humans but is not present at significant amounts in mice or rats, was assessed in a lifetime carcinogenicity study in Wistar rats at oral doses of 25, 75 and 200 mg/kg/day in males and 50, 150, and 250 (reduced from 400) mg/kg/day in females. Drug-related neoplastic changes occurred in males, in the pituitary gland (pars distalis adenoma) at all doses and in the pancreas (islet cell adenoma) at the high dose. Plasma levels of P95 (AUC) in males at the tested doses (25, 75, and 200 mg/kg/day) were approximately 0.4, 3, and 23 times, respectively, the human exposure to P95 at the MRHD of iloperidone. An increase in mammary, pituitary and endocrine pancreas neoplasms has been found in rodents after chronic administration of other antipsychotic drugs and is considered to be mediated by prolonged dopamine D2 antagonism and hyperprolactinemia. Increases in serum prolactin were seen in mice and rats treated with iloperidone. The relevance of these tumor findings in rodents in terms of human risk is unknown. The efficacy of FANAPT in the treatment of schizophrenia was supported by 2 placebo- and active-controlled short-term (4- and 6-week) trials. Both trials enrolled patients who met the DSM-III/IV criteria for schizophrenia. Two instruments were used for assessing psychiatric signs and symptoms in these studies. The Positive and Negative Syndrome Scale (PANSS) and Brief Psychiatric Rating Scale (BPRS) are both multi-item inventories of general psychopathology usually used to evaluate the effects of drug treatment in schizophrenia. A 6-week, placebo-controlled trial (n=706) involved 2 flexible dose ranges of FANAPT (12-16 mg/day or 20-24 mg/day) compared to placebo and an active control (risperidone). For the 12-16 mg/day group, the titration schedule of FANAPT was 1 mg twice daily on Days 1 and 2, 2 mg twice daily on Days 3 and 4, 4 mg twice daily on Days 5 and 6, and 6 mg twice daily on Day 7. For the 20-24 mg/day group, the titration schedule of FANAPT was 1 mg twice daily on Day 1, 2 mg twice daily on Day 2, 4 mg twice daily on Day 3, 6 mg twice daily on Days 4 and 5, 8 mg twice daily on Day 6, and 10 mg twice daily on Day 7. The primary endpoint was change from baseline on the BPRS total score at the end of treatment (Day 42). Both the 12-16 mg/day and the 20-24 mg/day dose ranges of FANAPT were superior to placebo on the BPRS total score. The active control antipsychotic drug appeared to be superior to FANAPT in this trial within the first 2 weeks, a finding that may in part be explained by the more rapid titration that was possible for that drug. In patients in this study who remained on treatment for at least 2 weeks, iloperidone appeared to have had comparable efficacy to the active control. A 4-week, placebo-controlled trial (n=604) involved one fixed dose of FANAPT (24 mg/day) compared to placebo and an active control (ziprasidone). The titration schedule for this study was similar to that for the 6-week study. This study involved titration of FANAPT starting at 1 mg twice daily on Day 1 and increasing to 2, 4, 6, 8, 10 and 12 mg twice daily on Days 2, 3, 4, 5, 6, and 7. The primary endpoint was change from baseline on the PANSS total score at the end of treatment (Day 28). The 24 mg/day FANAPT dose was superior to placebo in the PANSS total score. FANAPT appeared to have similar efficacy to the active control drug which also needed a slow titration to the target dose. Patients should be advised to consult their physician immediately if they feel faint, lose consciousness or have heart palpitations. Patients should be counseled not to take FANAPT with other drugs that cause QT interval prolongation [see Warnings and Precautions (5.2)]. Patients should be told to inform physicians that they are taking FANAPT before any new drug is taken. Patients and caregivers should be counseled that a potentially fatal symptom complex sometimes referred to as NMS has been reported in association with administration of antipsychotic drugs, including FANAPT. Signs and symptoms of NMS include hyperpyrexia, muscle rigidity, altered mental status, and evidence of autonomic instability (irregular pulse or blood pressure, tachycardia, diaphoresis, and cardiac dysrhythmia) [see Warnings and Precautions (5.3)]. Patients should be aware of the symptoms of hyperglycemia (high blood sugar) and diabetes mellitus. Patients who are diagnosed with diabetes, those with risk factors for diabetes, or those who develop these symptoms during treatment should have their blood glucose monitored at the beginning of and periodically during treatment. Patients should be counseled that weight gain has occurred during treatment with FANAPT. Clinical monitoring of weight is recommended. [see Warnings and Precautions (5.5)]. Patients should be advised of the risk of orthostatic hypotension, particularly at the time of initiating treatment, re-initiating treatment, or increasing the dose [see Warnings and Precautions (5.7)]. Because FANAPT may have the potential to impair judgment, thinking, or motor skills, patients should be cautioned about operating hazardous machinery, including automobiles, until they are reasonably certain that FANAPT therapy does not affect them adversely [see Warnings and Precautions (5.14)]. Patients should be advised to notify their physician if they become pregnant or intend to become pregnant during therapy with FANAPT [see Use in Specific Populations (8.1)]. Patients should be advised not to breastfeed an infant if they are taking FANAPT [see Use in Specific Populations (8.3)].